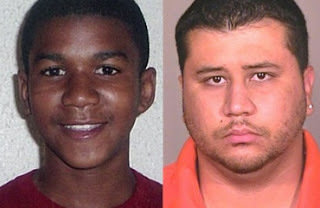 George Zimmerman, the Florida vigilante many believe shot and killed 17-year-old Trayvon Martin in cold blood, has created a website ostensibly to "thank" his supporters and to raise funds for his living and legal expenses. He's not been seen since the killing, and is feared to have taken flight. And if his lawyers dumping him Tuesday is any indication of things to come, Zimmerman's gonna need all the help he can get as special prosecutor Angela Corey may be preparing charges against him...which could be announced as early as today or the latest Friday. One thing's certain, it's never a good sign when your attorneys quit and you start pleading your case in the court of Sean Hannity and Fox News, as Zimmerman did this week. "On Sunday February 26th, I was involved in a life altering event which led me to become the subject of intense media coverage. As a result of the incident and subsequent media coverage, I have been forced to leave my home, my school, my employer, my family and ultimately, my entire life..."
What about Trayvon? What was he forced to give up? He's the one who's dead, not the self-pitying Zimmerman. As of this writing he has 7200 visitors. I can only imagine the amount of money he must be raising from his racist "supporters." On Monday Corey chose not to send the case to a grand jury, thus ruling out murder charges (in Florida only a grand jury could hand up such charges). She's now facing the biggest, most critical decision of her life. One that will not only have lasting impact on her career and legacy, but one which could have a major if not violent ripple effect across the country. If she files charges--most likely manslaughter--is there enough evidence (did Sanford cops blow the case with an inept investigation as many believe?) to actually convict? And if she elects to drop the case, will America face Rodney King II where the Spring/Summer heat, the economy/unemployment, and anger over the case bloody the streets? The one haunting fact of this case still remains: that a 28-year-old man with a 9mm semi-automatic gun left the security of his locked car--when instructed not to by 911--and confronted a teenager holding an iced tea and a bag of Skittles and shot him to death. Zimmerman's "self-defense" claim is both unfathomable and unconscionable. Justice needs to be served here, and quickly. Parents, Get Your Kids to Watch This Show!